The Australian's resume includes "The Crow," "Dark City," and "I, Robot." “I, Robot” and “Dark City” director Alex Proyas took to Facebook to criticize the #MeToo and Time’s Up movements. 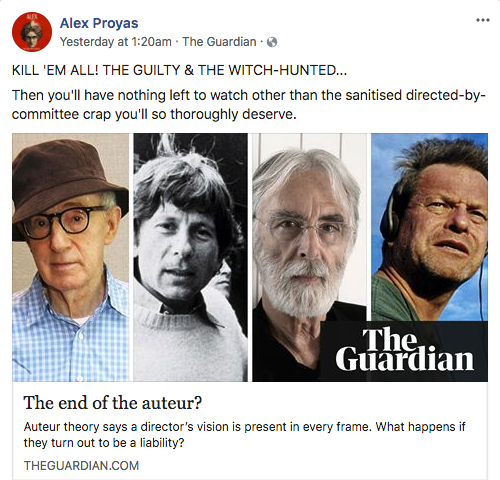 His inspiration was a story in The Guardian, “The end of the auteur?”, which asks how best to approach work by filmmakers whose offscreen behavior has invited controversy. Although Proyas currently lists CAA and Believe Media as his agency and his management company, both said he is no longer a client. Listed numbers for Proyas’ New South Wales, Australia-based production company, Mystery Clock Cinema, were not in service. IndieWire reached out to Proyas via Facebook and Twitter, and we will update this story if he responds.